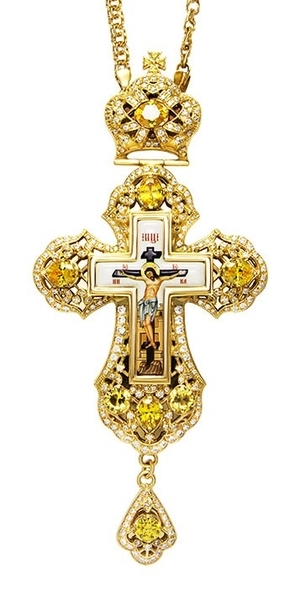 Pectoral cross - A180 (with chain) - Istok Church Supplies Corp. This clergy pectoral cross of large size of traditional round shape is made of brass and decorated with high-quality gold-gilding, applied by galvanic method. The central crucifix is ? ?large, manufactured using a special technology of color image imprinting on a brass base. It is coated with a compound that protects it from mechanical damage and exposure to light. Large oval phianite stones of excellent quality are surrounded by a scattering of smaller stones of contrasting color. All the stones are hand-tied, so they will be on the places intended by them all the time with the wearing of the cross.